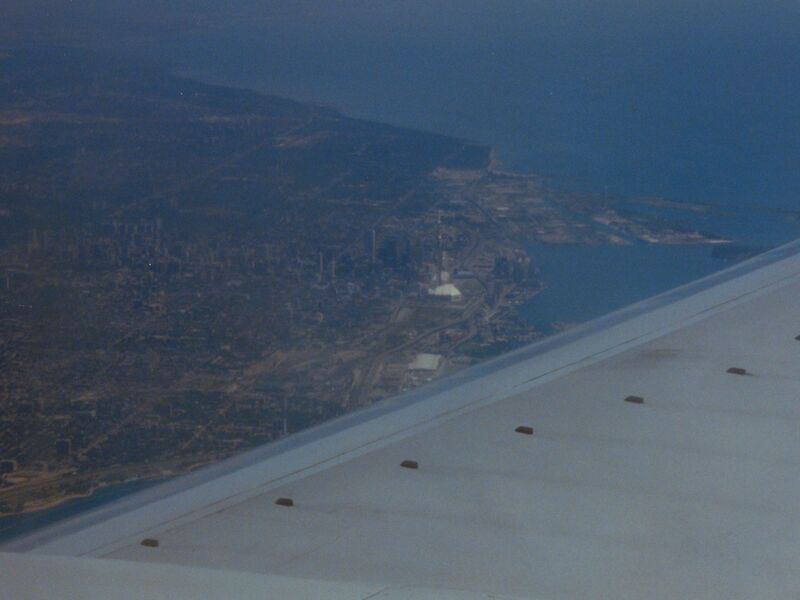 For a few days in August 1999, I visited Toronto, Ontario, Canada with my mother. We left on August 7, and returned on August 10. While there, I got to meet my friend Sarah Lanthier and her family in person for the first time (we met through the Internet a couple of years prior to that), as well as see the department store that I had known since my youth through Today’s Special, as well as go as high up in a building as I had ever been. On August 7, a Saturday, as usually happens on a day I have to get up early at home, Mom woke me up. I got up, ate some cereal for breakfast, took my shower, and brought my stuff down to the car to load in to go to Canada. We took the Previa, and after hugs from Dad and Sis, we were on our way to Charlottesville, to sit and wait. The trip over was pretty usual for going to Charlottesville. Interstate, 29 bypass, 29 through Charlottesville, and then out to the airport. Upon our arrival at the airport, we went to park. After a few laps around the parking lot, I finally found a parking spot that suited me. It was a fairly decent spot, about in the middle of the parking lot. So Mom and I got out, got all the stuff we packed, checked and double-checked that we had our passports and tickets, and we were on our way up the elevator to the airport. If you’ve never been there, Charlottesville Airport’s parking lot is the equivalent of one floor lower than the airport terminal, and the airport was nice enough to provide an elevator up to the terminal level. And with heavy luggage, it was a welcome thing. Has the bag been in your control the whole time? Did you accept anything from someone to take on the plane with you? After that brief questioning, it was on to airport security to gain access to the waiting area. There, we went through the metal detector, and placed our stuff on the conveyor belt for the x-ray machine. It’s always neat to see your stuff on the monitor when you go through there. That’s when you realize… “OOPS! I forgot my underwear!” After passing through the metal detector without a hitch, we had to demonstrate that my cell phone (which we brought just in case) really was a cell phone. That was accomplished by turning it on for the security officer for her to see that it really was a cell phone. And a nice one at that. Now that we were in the airport lounge, it was time to wait for the plane. During that time, Mom and I talked about all kinds of stuff. We talked about the ocean liners featured in my Fifty Famous Liners book, which I had brought along for the plane ride, we talked about Mom’s group for the next school year, and who was in it, we talked about the upcoming events on our trip, and all kinds of stuff. But we had carried out our family’s philosophy about air travel… hurry up and wait. Our plane was similar to this, a Dash 8 in USAir colors. When our flight was finally called, we headed out to the plane, a Dash 8. Before boarding, we checked our bags at the gate. 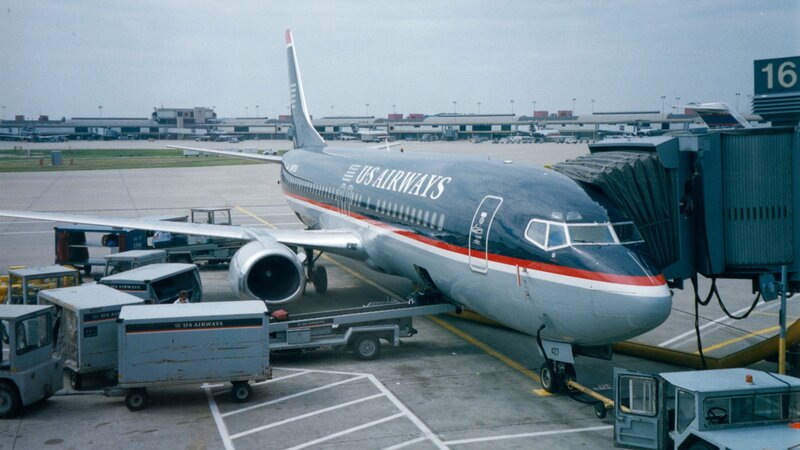 After everyone was boarded and buckled in, the plane started moving away from the terminal, and out to the runway. As you well know, the plane is equipped with emergency exits in the front and rear of the plane. If you are seated in an exit row, you may be required to assist the crew in an emergency. If we have a loss of power, the aisle lights will light, turning red near an exit. The lavatory is equipped with a smoke detector for your safety, and tampering with the smoke detector is a federal offense. This flight is designated non-smoking, so there is to be no smoking at any time during the flight. And with that spiel over with, the flight attendant sits down in her rear-facing seat, buckles in, and then the captain takes to the air! I usually take to air rather well myself, too, because we can’t live without it. Seriously, though, we were then in the air, en route to Pittsburgh. I was watching out the window religiously the whole time, since remembering from the flight back from Pittsburgh to Charlottesville during our England trip, we went over either Waynesboro or Staunton. Since it was daytime this time, I finally got to identify the city we flew over last time. As it turned out, much to my surprise, it wasn’t Waynesboro or Staunton that we flew over. While it was disappointing that I didn’t get to see CFW (now Telegate) from above, the city that we flew over was still one that had significance to me. Namely, it was Harrisonburg that we flew over. More specifically, JMU, which was to be my home in less than three weeks. I first found the stadium (you can pick up a football field’s worth of Astroturf really well from the air), and then also found the ISAT Building. I took pictures, but unfortunately, they didn’t come out. The rest of the flight was fairly blah. They turned the no-smoking sign off and back on for an instant to signify that it was beverage time, and I made my usual joke about that it was the airline’s challenge to the passengers to smoke an entire cigarette during that brief moment. But it was beverage service time, and so the flight attendant pulled back her little curtain, and unlocked the beverage cart. As the cart came down the aisle, I scoped out what she had (Coke products), and determined that I was going to get a Sprite. I also got a little bag of pretzels (can’t get those on the ground! ), and then bottoms up! After beverage service finished, and the flight attendant collected the waste and distributed the mints, we were almost to Pittsburgh. In the terminal, Mom and I headed for the B terminal from E terminal (where the commuter jets flew). 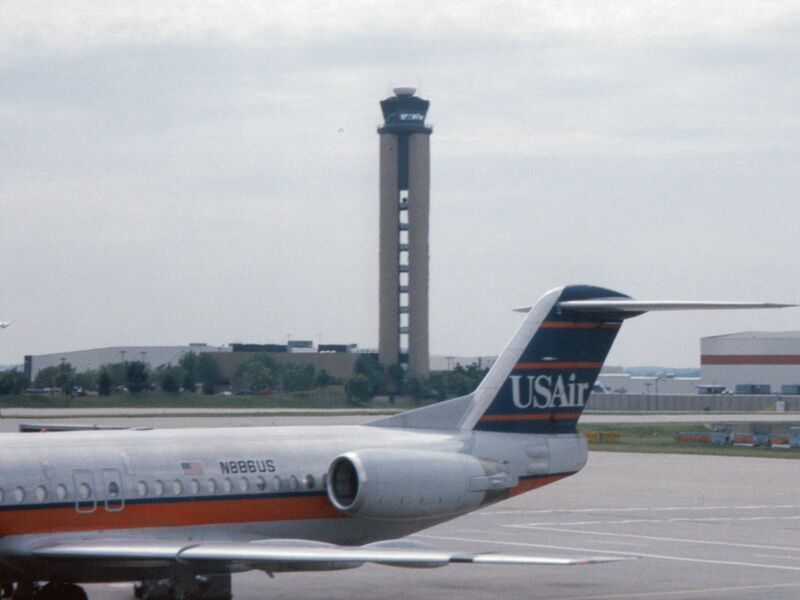 This entailed a few escalator rides up, a shuttle to the main A through D terminals, and then more escalators. I found the Victoria’s Secret that I saw from our England trip, and Mom and I also stopped at the Speedo Authentic Fitness store, since I had forgotten my swimsuit (it’s not like I actually used it, though). We went in, bought a suit (not a “Speedo”, but a regular suit), stuffed it in my bag, and continued. We eventually found our gate, and parked. While I went to find some food for us as well as use one of the more-than-twenty urinals at the Pittsburgh airport, Mom stayed with the bags. The Pittsburgh International Airport has moving sidewalks. This made it very easy to find food, since I could go more than twice as fast past the shops and whatnot. But I eventually found an Auntie Anne’s, and went back to ask Mom what she wanted. I then got the pretzels (can’t eat them by just thinking about them), and we ate our pretzels. 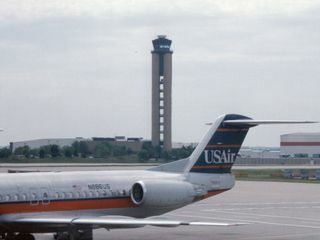 The control tower in Pittsburgh. The plane that would take us to Toronto. Then Mom got back, and soon enough, it was time to board the plane. We got on our plane (and the picture at left really is the plane we took), we stowed our stuff overhead, and then we buckled in, and I discovered that I was a bit chubbier than preferred. For this trip, unlike to England, we flew coach because it was only a 40 minute flight. However, the flight was not fully booked, and thus Mom and I had a seat between us, which was nice, because it gave me some extra room to spread out. On this flight, we had air-phones in the seat in front of us. Of course, it was much more than either one of us wanted to spend to have the novelty of calling from the air (since cell phones are prohibited), so we just looked at it. But soon enough, we were backing away from the gate, and then we were in the air again. No beverage service on this flight, since it was so short. It literally seemed like as soon as we got up off the ground that it was time to touch down in Toronto. It was neat seeing Canada in person for the first time. And then soon enough, it was time to touch down at Pearson International Airport. Toronto, as seen from the plane. That white spot in the center of the picture is SkyDome, and then directly behind it (but not easily visible in this picture) is the CN Tower. We got off the plane, and headed straight for customs. We showed the guy our passports, and he said welcome, as was to be expected. He also commented on the large band-aid that I had on my left arm at the time (you will get to see this band-aid later). I explained that it was from when my sister scratched me a few days ago, and he said to tell her that if she came to Canada, that she was “screwed” (for scratching me). After this, we changed some of our money to Canadian money, and headed on out. The first thing we did was determine which bus was ours to take to the Delta Chelsea Hotel, and bought a ticket for it. We got on the bus, which proceeded to three hotels. The first stop was the Royal York Hotel, where some passengers got off. The next stop was the Sheraton Centre, and more people got off there. As a side note, I first got acquainted with this hotel through Today’s Special, because on the episode “Travel”, Sam stayed at this particular hotel. But after the Sheraton Centre, it was off to the Delta Chelsea. Upon arrival at the Delta Chelsea, we quickly checked in, and headed up to our room, number 1667, up the blue elevators (there was also red and green) to the 16th floor. We dropped our stuff, checked the room out, and then got a call in the room from Sarah’s father Norman, saying that they were down in the restaurant. So down the blue elevators we went, remembering always to take our keycards with us wherever we went, and down to the Market Garden we went. Here, we met Sarah in person for the first time, her mother Darlene, and her father Norman. We all talked and got to know each other, and Sarah and I got to talk voice-to-voice for the first time without running up a nightmare of a phone bill. It was truly neat getting to meet for the first time someone that you have gotten to know for some two years through the Internet. While in the restaurant, we got to find out that Sarah and her family didn’t have a room yet. This was due to that the hotel was extremely lenient with people checking out late that morning, and that their room wasn’t ready yet (they drove down from Sudbury, Ontario). But while we were waiting, we all had a fine time together talking about stuff, and consuming lots and lots of coffee. One topic that came up during this time was comparing our countries’ money. Sarah and Norman commented that our money would be hard for Sarah to see, it being all green, and we thought that up to $2 being coins was neat. We also got to meet Pete and his family, who also lived up in Sudbury and had come down to Toronto. I got to know and enjoy him and his family as well. Later on, Sarah’s room was ready, and they went to get settled in. We went back to our room and then we all met back in the lobby later. 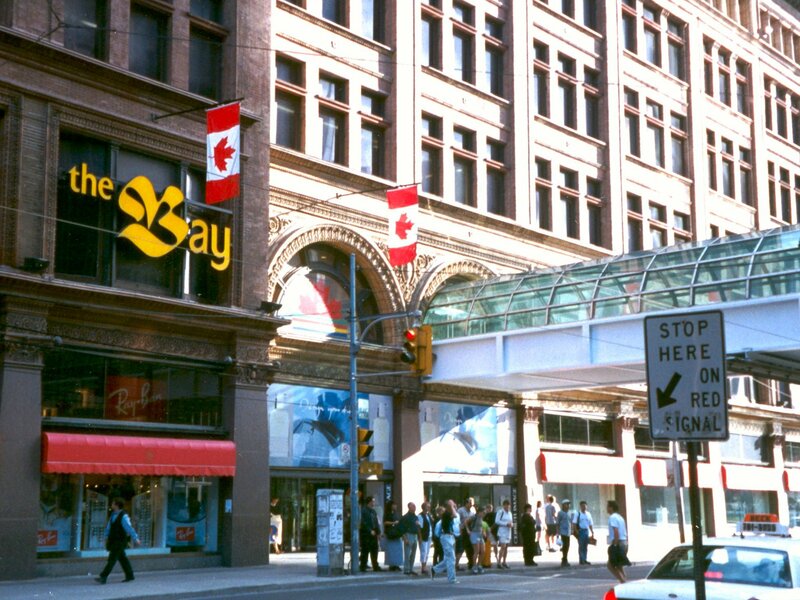 Then, Mom, Sarah, Norman, Pete, and I all went down Yonge Street together, in the direction of the store (you will hear me refer to The Bay at 176 Yonge Street as “the store” more than once – details further on). Pete was out getting a birthday cake for his daughter, and the rest of us were just out seeing things. Leaving the hotel, we went out the Yonge Street entrance. After going out, we found that there was no wheelchair ramp for Sarah. This didn’t stop Pete, who was driving Sarah at the time. Though exercising the utmost care in getting the chair down, it was still rough for Sarah. But she got down the stairs in one piece, and that’s what counts. At this point, let me remind you that Toronto has streetcars. And with streetcars come tracks. And Sarah rides in a wheelchair because of her knee, and I was driving it. Now I must confess that I hadn’t driven a wheelchair in years. But I did all right, until I hit the streetcar track, almost throwing Sarah on her face in the middle of Yonge Street. Thankfully, it didn’t come to that, and we determined that Sarah needed to be backed up over the tracks. This worked without a hitch, and we went over many more this way. Eventually, we made it to the Toronto Eaton Centre. We passed by this for now. And then, looming in front of us was THE STORE. This was the store where they filmed Today’s Special. We went around to a rear entrance, as we wanted to see the store. Then, came the moment I had been waiting for since I first laid eyes on Today’s Special. I placed my hand on that revolving door, and walked through it, and I WAS IN THE STORE! I went up to the main floor, and I was in heaven. I had seen this store since I was two years old, and now I was finally inside of it. I went up a level on the famous escalator (which Jodie carried Jeff as a mannequin up on the opening credits), and looked down from the balcony over the fragrances. I then went back down via the escalator, and rejoined everyone outside again, and we all returned to the hotel. Interestingly enough, and unbeknownst to me at the time, we were standing directly in front of “the window”, as shown on the episode “Jeff”, and pictured at right from Today’s Special. Later on that evening, we got to meet Anni for the first time, who lived in Toronto, and was a good friend of Sarah and family’s (and soon enough Mom and me). We also took some pictures, primarily of Sarah and me. In this picture at left, you can see Sarah and me (wearing the aforementioned bandage) in Sarah’s room, sitting together on the bed. Interestingly enough, and completely by accident, we matched that day. When I got dressed at home in Stuarts Draft that morning, I picked black shorts and a red shirt. In Sudbury, Sarah picked black shorts and a red shirt. What do you know – we matched! 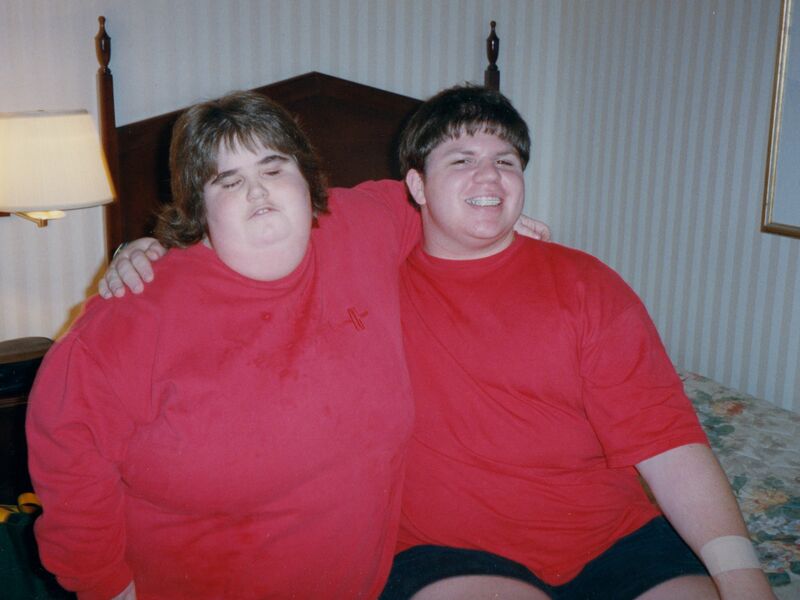 Sarah and I in our matching outfits. When Pete got back, we all determined it was about time for dinner. We decided that we would go to the Toronto Eaton Centre for dinner. The stores had already closed, but the restaurants were still open. We determined that we would go to East Side Mario’s, a New York Italian restaurant. It was fun. In front of the restaurant, as seen at right, was a model of the Statue of Liberty, all decorated with streamers and lights. 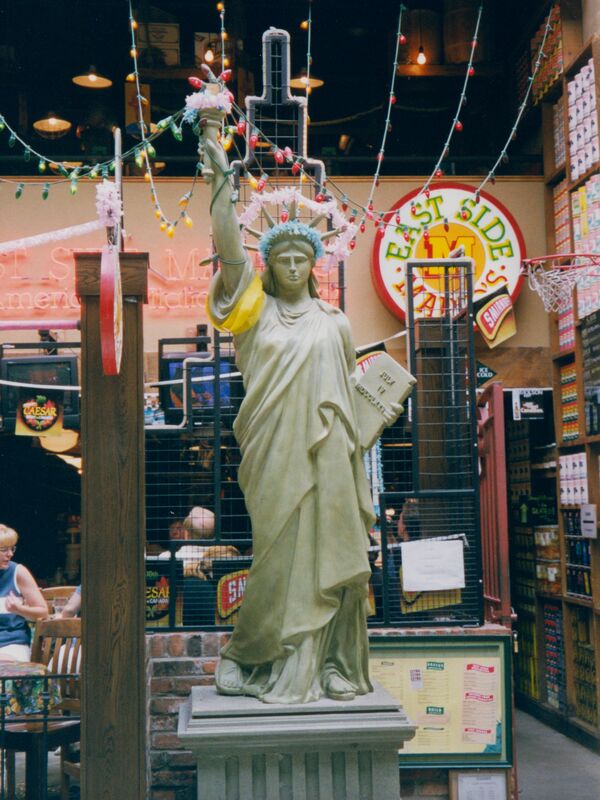 The Statue of Liberty at East Side Mario’s at the Toronto Eaton Centre. We were seated inside the restaurant, with Sarah at one end, then Pete and his family, then Darlene, Anni, Mom, me, and then Norman at the other end of the table. We all ordered, from the menu that depicted an illustration of the Statue of Liberty making different facial expressions and facing a number of directions, all in good taste. Then we got the salads (which were shared), and later on the food came. I unfortunately can’t remember what I had for dinner, but before that, though, Norman grew tired of the light directly above him, with it being almost in his face. So, he reached up, and loosened the bulb sufficiently to put it out. All of us at the table at East Side Mario’s, courtesy of Norman. 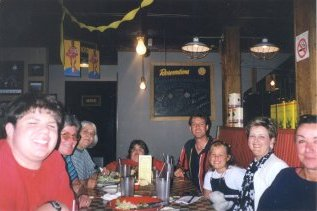 From left to right, there’s me, Mom, Darlene, Sarah, Pete, Melissa, Carmen, and Anni. After the food came, we ate of course, and if you recall, it was Pete’s daughter’s birthday. East Side Mario’s has a wheel that you spin for birthdays. The employee said it was just like the wheel on The Price is Right, and so she spun! I don’t remember what it was that she spun, but I recall her enjoying it a lot. After we finished at East Side Mario’s, it was dark, and it was time to return to the Delta Chelsea. We proceeded to Pete’s room, where it was time for cake, as well as watching his daughter open presents. It was a very fun time, getting to know everyone, and having cake, and then witnessing as Pete’s daughter got a Nintendo 64 – exactly what she wanted – for her birthday. And then, as all things do, the day came to an end. Sarah and her family returned to their room, and Mom and I returned to ours, and got some much-needed shuteye. It was strange sleeping on a bed twice the size of my usual bed, but I managed, sleeping right smack in the center of it. And that was the end of the first day.